The jump from 3G to 4G brought you the revolutionary era of smartphones, mobile banking and e-commerce. But if you thought that was big, think again. To get a sense of what that actually means, imagine downloading a movie on your phone in a matter of seconds —or better yet, having your autonomous vehicle communicate with smart city sensors in real time. Powering autonomous vehicles, smart factories (IIoT), remotely controlled drones, VR and AR, in-home IoT, and the world’s first smart cities, 5G is about to allow every person on the planet to tap into data from billions of sensors around the globe. Coming out of Google’s X — commonly known as the ‘Moonshot Factory’ — Google Loon is building out balloons that can direct themselves up and down the stratosphere, creating an aerial wireless network with up to 4G LTE connection capacities. Having successfully provided connectivity to over 100,000 Puerto Ricans after Hurricane Maria in 2017, Loon aims to put thousands of balloons in the stratosphere, giving you connectivity anywhere on the planet. Backed by billions in funding from Qualcomm, Richard Branson and SoftBank, among other investors, OneWeb is working on a constellation of about 1,980 satellites in total. And just this past June, the satellite broadband company received Federal Communications Commission (FCC) approval to serve U.S. customers with a constellation of 720 satellites. Charging full speed ahead with its ambitious project Starlink, SpaceX has unveiled plans for a 4,425 satellite constellation in low Earth orbit to cover the globe with megabit and gigabit speeds. But as OneWeb and Starlink jump onto the scene, their low Earth orbit constellations are predicted to offer broadband speeds with unprecedentedly low latency. As of 2016, OneWeb’s constellation was designed to have just 30 milliseconds of latency — a remarkable leap for satellites. And with SpaceX’s intended proximity to Earth, latency delays would only continue to plummet, one day reaching comparability to current cable and fiber response times. As explained by SpaceX VP Patricia Cooper to the U.S. Senate Chamber of Commerce, Starlink’s network would provide 25ms latency and 1 Gbps speeds. Zoom out another several thousand kilometers and you’ve reached O3b’s fleet. Working at an altitude about 8,000 kilometers above the Earth, O3b — or “Other 3 Billion” — has already built out an initial fleet of 16 satellites, including 4 new ones launched just this past spring. Offering coverage to almost 400 million square kilometers — four-fifths of the Earth’s surface — O3b mPower could become the most bandwidth-efficient system ever. Combined, these privately run fleets could one day meet the internet traffic needs of entire countries, far-flung islands smattering the Earth, and the most remote of peoples, now accessing a trillion-sensor economy on-demand, and at historic speeds. 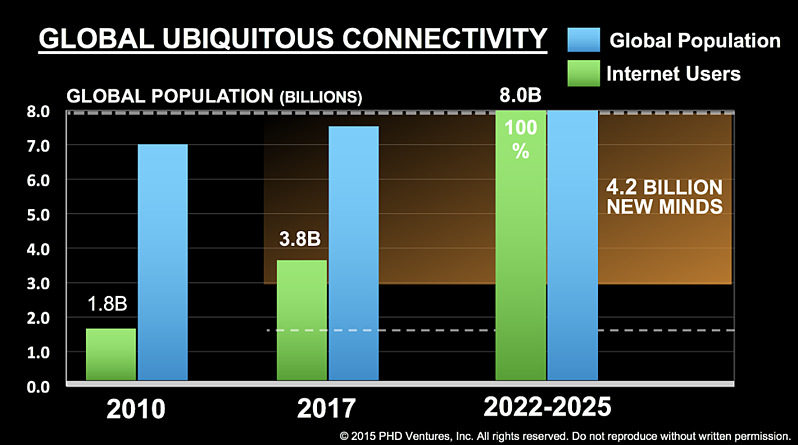 With 5G on the ground, balloons in the air and private satellites blanketing the Earth from space, we are on the verge of connecting every person on the planet with gigabit connection speeds at de minimis cost.